Cord cutters are referred to usually as people who've dumped cable TV, either going only with off the air signals or using alternative services such as Netflix, YouTube and the like as ways to get their programming fixes. But there's another type of cord cutting that could be quite attractive to some consumers, and that's the cutting of the cord between your smart device/music player/whatever and your headphones. It's a legitimate cutting if, like me, you tend to get your cords tangled and twisted all the time. I generally use my Bose QuietComfort 20 noise cancelling ear buds when I want tunes on the go and they're still my favourites, but I still tend to get tangled up in the cable at times – and, if nothing else, being wired to the device (any such device) means you have to take it with you wherever you go – including to the bathroom (and water with electronics can be an accident waiting to happen). Then the folks from OnePlus got in touch with me to offer a review of their new, and first-ever, wireless earbuds: the Bullets Wireless. These $99 CAD buds connect with your source device via Bluetooth which, while perhaps not the ultimate in audiophile audio quality, is certainly a wonderful convenience. And they work well, too! OnePlus also makes a line of smartphones, by the way. I've never tried one so can't comment on their features etc., but if they work like these buds they're probably fine. They do appear to be built well, and they're very convenient. They come in a handsome little white box that also includes a little red plastic carrying case that, thanks to my lack of grace, is a little hard to get the buds into – especially when I try to keep the buds stuck together magnetically. 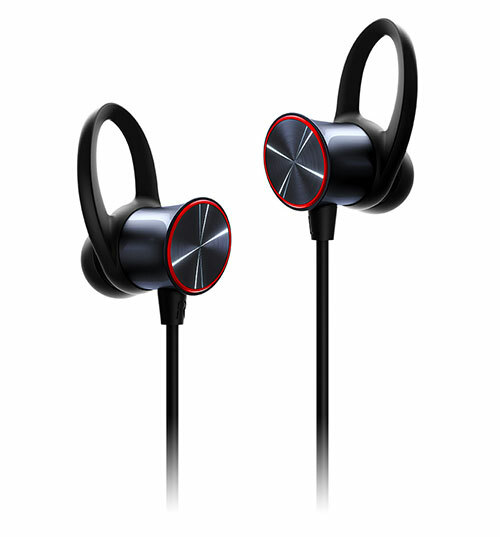 They also come with an extra couple of earpieces of varying size, so they can be "customized" to fit your ears better. The default ones were too big for me, but one of the others works fine. And what I really love about them (besides their sound quality, though I do find them just a tad bassy), is that if I'm listening to something and have to get up for some reason (bathroom break, snack seeking, whatever) I can just get up and walk away and the tunes (or whatever) continue while I'm gone. Naturally, there's a distance caveat here, but in my suburban home I could go virtually anywhere without losing the signal, including out onto the back deck. I love that convenience. I would be remiss in not mentioning that the Bullets Wireless aren't completely wireless, in that while there's no physical connection between buds and device, there are wires between the buds. This is actually a good thing, because I found that despite my best efforts the buds would sometimes come loose and fall out of my ears, so if they were truly wireless I'd probably have lost them by now. Besides, those wires also give you access to the charging port (USB) and, of course, the battery has to go somewhere. But the whole shebang is slim and convenient and you can wear the wire "strap" behind your neck like some folks do with their eyeglasses, keeping them handy and safe, yet still operating wirelessly from the device. The earpieces are nice and light and once you find the right size bud they're pretty comfortable and can be worn for hours without a lot of discomfort. As mentioned above, they're also magnetic, and if you click the buds together that way it also shuts them down, to save battery life. It will pause your music playback as well, which is pretty handy. Just a bit down the cord from one of the buds is a small remote control device/microphone with which you can control playback (navigate musical tracks, take phone calls etc.) and the volume. Sound quality with phone calls is fine (naturally, it also depends on the phone). You can also use the buds with Google Assistant, the manufacturer says. I don't, and won't, use such devices but have no reason to think the buds don't work as advertised. The company says Google Assistant will work with all OnePlus devices that run the latest Google app. They also note that some features may not be compatible with other devices. In other words, your mileage may vary. I listened to a variety of music via the Bullets, sticking as much as possible to tracks I know are of good, audiophile quality. And for the most part, they performed very well (mild bassiness notwithstanding), and you can crank 'em quite loud without distortion or excessive shrillness. I didn't notice any preference as to type of music, which is as it should be. I still prefer the sound from my Boses, but that's not a fair comparison, since they're priced very far apart ($99 for the Bullets versus $329 for the Bose) and the Bullets don't have noise cancelling. Naturally, a full charge will take longer than the 10 minutes the five hour performance takes; I didn't time the full charge, but another review I saw said that 40 minutes should give you up to eight hours of playback, which is pretty good: you can charge 'em up while waiting for your plane and they should last the entire flight unless you're off to far flung locations. The Bullets Wireless, according to their maker, are designed "to withstand the everyday risks of water damage from rain, sweat and stray splashes, but please avoid prolonged contact with water. Take them for a run yes, but not for a swim!" So I guess they can handle perspiration, but not inundation. I really like these OnePlus Bullets Wireless. My wife does, too: she tried them a few times while commuting to work via public transit, and they were perfect for such an application. She's more into the comfort and convenience than the audio quality, so it was nice getting that perspective. And that means the buds are ideal for either of our needs. And for a hundred bucks they seem like a very good value.